Today I ate the Lucky Green Tea (which is quinoa, veggies & tofu that have been simmered a green tea miso reduction). My husband had the Southern Vegetarian (collard greens, millet corn casserole, smashed potatoes & shiitake mushroom gravy with dots of butternut squash). My kids ate the R’s Veggie Burger, which is delicious and exactly what kids always want! We also had The Thai Express (quinoa with sautéed veggies & tempeh in a spicy peanut sauce). As you can tell, we can’t ever quite decide on what to order! To top it all off, there is always an incredible vegan dessert! (Tonight’s was a slice of hummingbird cake, which was incredible with hints of pineapple & coconut… Last time we were there we had a slice of raw apple pie that was FANTASTIC!) Oh yeah, they have some raw dishes too! I could go on and on… I seriously recommend checking them out! 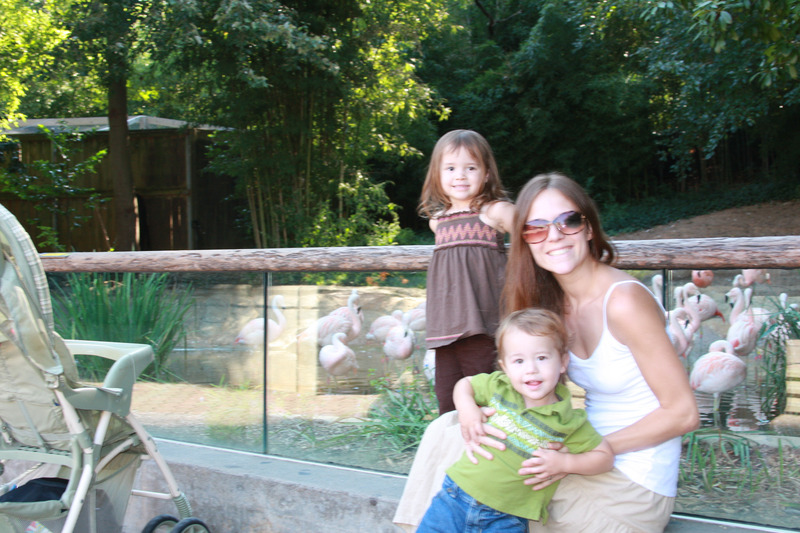 We have been to the Atlanta Zoo a few times already this year. I know there are many vegans that don’t believe in going to the zoo, since the animals are there locked inside without a choice. I do see their point. But I also grew up going to the zoo and I sincerely believe that it nurtured my love for animals. Seeing these animals face to face definitely encouraged my curiosity and love for other living beings. Where else would a child see these amazing creatures, like an elephant, giraffe or gorilla… without going to another country or in a book? I think seeing these animals and looking into their eyes, studying their movements, seeing how they are like us, or how they are different, is key to developing love and respect for animals. In a way, the animals in a zoo are martyrs. They very unfortunately give up their lives and personal freedom, but by doing so, they foster love for animals in children of all ages, even adults. If these animals being captive can help us understand and learn to appreciate other animals in the wild, I believe it is worth it. I will always feel sorry for them, yes, but what they are giving to the world is priceless. For every child that falls in love with one animal they see at the zoo, a positive future for all animals in the wild rises. Maybe they can even teach US how to live in peace and love each other a little bit more. This entry was posted in Out & About, Uncategorized and tagged Atlanta Zoo, Out & About, R Thomas, veg restaurants, zoo. Bookmark the permalink. I’ve been to R.Thomas only once, but I remember that I liked it! As for your zoo philosophy, that’s very interesting. I feel the same way about the aquarium. Do dolphins enjoy swimming around in a tank all day, every day? Most likely not. But they educate people, especially the young, who may one day make a difference. you know, since you mentioned it, i have heard that animals like dolphins that communicate through sonar have an especially tough time in an aquarium setting… something about the sonar waves bouncing off the tank walls… i love watching dolphins but i think aquariums could do without them… it isnt THAT hard to get to a beach to see them in their natural environment! I think even some of those places where you can swim with dolphins have them in an enclosed area like a cove… at least there they are still in their natural waters!